This show was on a whole just disappointing, No where on the application or on the web site does it seem like this is anything other than an art/craft show, but it isn’t. It is a street fair filled with cheap imported junk- from wood bowls for $10, to sunglasses, and filled with cheap jewelry. The other soap lady there didn’t even make her soap, it was glycerin soap from some overseas company, with the name and place it’s made stamped right on each bar. She was selling those for 5/$10. Somehow I didn’t loose money, but I sure didn’t make any either. I was between the pretzel people and the computer fix it company, so I knew right as I arrived that I was probably not going to have a good day. The other real crafters I talked to didn’t fare that well either. And you know you’re in trouble when there is only 4 port-a-pots in the whole place, and the food vendors have a dollar menu. This combination spells out low attendance that doesn’t want to spend money. Monday my dad was here. The day was dedicated to painting the bedroom and going through our extensive DVD list and making sure it is up to date. Tuesday in the morning I brought my dad to rent a car so he could continue on his vacation. I put chlorine in the hot tub, paid bills, made a few phone calls, cleaned the cat pan, took out the garbage, went to the bank, bought more cat pan liners, cleaned the cat water bowl, made some salads, rearranged my cookbooks and got rid of some I don’t use, and finished arranging the DVD’s. Wednesday I helped H get together his application for MLAC. I answered S’s email so we could arrange when she could deliver my purchase from Fire Mountain Gems, I typed up and e-mailed out my newsletter, and I finished a project I had to do regarding zip codes and my average sales. Thursday I printed out my newsletter, went to MLAC for the jury session, stopped at Trader Joe’s for some groceries, finished my fragrance spreadsheet of all my samples, and C and I went to Kohl’s to buy a rug for the bedroom. Friday I cut up soap into bars and milled as well. I also made soap, labeled my fragrances and go a bunch of new purchases rebottled, and did both laundry and dishes. Saturday I finished painting the wall, packed the van, gardened, and went to a bazillion yard sales where I found some cute glass bottles, a cool green ceramic bathtub, and some books on gardening and knitting. Dad came back in the afternoon and we all went to a nice dinner out. Garlic is both a medicinal and culinary herb. It was once thought to possess powers against evil and has been widely used in charms and spells. Most legends tout garlic as a way to increase strength, speed, and endurance. Medicinally garlic has been prescribed since prebiblical times. It has been used to treat high blood pressure and respiratory problems, as well as headaches, worms, bites, and tumors. During the seventh century it was prescribed to kill worms, protect against various plagues, eased earaches, counteracted some poisons, and took away skin blemishes. Later it became main ingredient in Four Thieves Vinegar, a folk remedy sold in France since the early eighteenth century. Native Americans knew wild garlic well and used it in their remedies. Settlers brought over additional domestic varieties and pioneers put garlic in their horses’ noses to counteract the effects of high altitude. The same component that gives garlic its pungent odor also destroys or inhibits various bacterial, fungi, and yeast. Allicin is formed when cloves are crushed and is equivalent to 1% penicillin. It has been shown to be effective against some flu viruses, as well as athletes foot, and is more effective than penicillin against typhus. It works against staph and strep bacteria, cholera, and dysentery. Garlic is a traditional cure for worms and parasites in people and pets. A clove of garlic a day my keep your dog free of worms. Garlic is also traditionally used in China and Europe for respiratory ailments. Tuberculosis is treated with an inhalant of garlic oil, and whooping cough is treated with a rubdown of garlic and lard on the chest and back. You can also take a teaspoon of garlic syrup to relieve congestion. 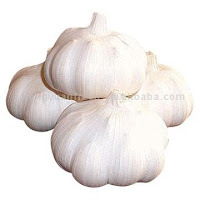 In China garlic has been used to treat high blood pressure and other circulatory ailments. Studies have just started in Western medicine concerning this possible effect. Studies have shown that the oil inhibits blood clotting, and reduces cholesterol in the blood and reduces the clogging of arteries. Investigators in China are also looking into the possibility that garlic prevents gastric cancers. Studies are also looking into the possibilities for garlic as being useful against colic, colds, kidneya and bladder troubles, toothaches, and snakebites. Poultices and rubs used directly on the skin can cause irritation and blistering. Recommended for use primarily as a hypolipidemic and a antihypertensive agent but has also found use as a antineoplastic. Garlic preparations are used to effect blood lipids, fibrinolytic activity, low density lipoprotein oxidation, blood pressure and to prevent and treat cardiovascular disease. Garlic-derived compounds have shows antimicrobial properties and antibacterial properties as well as antifungal activity. Garlic tablets studied in vitro have been found to enhance “killer cells”- an important part of the immune system in fighting cancers, viruses, and certain bacteria. The antioxidative effects are responsible for decreasing poor cellular function and premature aging. Many studies have demonstrated garlic to inhibit platelet aggregation which may cause postoperative bleeding. Garlic has an effect on vessels but its mechanism of action has not yet been clarified. It may reduce the amount of cholesterol deposited on the blood vessel linings. Studies indicate that garlic act as a natural antibiotic with broad spectrum antimicrobial activity, including some antibiotic resistant organisms. Acrtivity of commercial garlic extract against meningitis in clinical studies indicate that active components may pass the intact or disrupted blood-brain barrier. The ability of garlic to inhibit cancers may be due to interference with carsinigens, especially those that require metabolic activation. Some studies have shown garlic consumption associated with a reduced risk of stomach and colorectal cancer. There is a potential for use in the treatment of bladder cancer. Garlic may inhibit carcinogenesis, inhibit cancer cell growth, and promote chemical carcinogen detoxification. A preliminary study suggests garlic may be an effective adjunctive therapy to chemotherapeutic agents in treatement resistant or treatment relapsed acute myeloid leukemia. Numerous studies have demonstrated that garlic possesses hypercholesterolemic effects, the mechanism of this effect has not been clarified. It may involve a reduction in excess lipids, lowering of hypertension, and prevention of thrombus formation. Garlic may reduce lipid content in arterial cells and prevent intracellular lipid accumulation. Garlic reduces cholesterol but is a clinically inefficient means of doing it. Antiplatelet aggregation activity is only present in the blood for a short time (less than one hour) and the antiplatelet aggregation mechanism has not been fully clarified. Garlic is used internally as an adjuvant to dietetic measures for elevated lipid levels. It is also used for the prevention of age related vascular changes and arteriosclerosis. Used internally for inflammatory respiratory conditions, whooping cough, upper respiratory tract inflammation, and bronchitis. Also used for gastrointestinal ailments, especially those associated with flatulence and gastrointestinal spasms. Other uses consist of menstrual pain, and treatment of diabetes, constipation, and fever.. Externally it is used for corns, warts, calluses, muscle and joint pain, neuralgia, arthritis, and sciatica. Garlic may increase the risk of bleeding and should be discontinued for 10 days prior to elective surgery. Not to be used while breastfeeding. Anaphylaxis, offensive odor, burns, nausea, and anticoagulation resulting in bleeding have been reported. Adverse effects such as headaches, myalgia, fatigue, and vertigo have been seen with therapeutic doses of garlic. Gastrointestinal symptoms and allergic reactions are possible. Mild and infrequent adverse reactions include belching, flatulence, and constipation. Garlic can “burn” the skin if kept in contact for hours or days at a time. Rashes at the ingestion or injection site have been reported. Prolonged high dose therapy have shown signs of possible liver toxicity, with elevated liver enzymes being found. Body odor and halitosis are common side effects of garlic ingestion. Antiplatelet effects of garlic could add to the effects of anticoagulants, Antiplatelet agents, low molecular weight heparins, and thrombolytic agents. Regular ingestion of food products containing small amounts of garlic should not pose a problem. Garlic oil significantly induced the metabolism of chlorzoxazone but other garlic formulations may not have the same effect. NSAIDs such as indomethacin could increase bleeding time. Regular ingestion of food products containing small amounts of garlic should not pose a problem. Avoid use of garlic when using protease inhibitors. Garlic use can increase the toxicity of the protease inhibitor. The first “prescription” for garlic dates to a Sumerian clay tablet from 3000 B.C. The entire ancient world, but especially the Egyptians loved garlic, with the herb even being found in the tomb of King Tut. Garlic was listed in the world’s oldest surviving medical text, Ebers Papyrus, and was an ingredient in 22 remedies, including those for headache, insect bites, intestinal worms, menstrual discomforts, tumors, and heart problems. Garlic has been eaten before athletic events and before battle for strength and agility; it has been hung in rooms to safeguard against disease and witchcraft and to keep evil spirits at bay. Greek and Roman physicians also loved garlic. It was recommended for leprosy, infections, wounds, cancer, digestive problems, and heart problems. India’s Ayurvedic healers also prescribed garlic for both leprosy and cancer. By Medieval European times garlic was shunned by the rich, but the poor saw it as a preventative and a cure all and by the 17th century the rich returned to using it as a cure all, albeit only sparingly. America in the 19th century conceded its effectiveness in treating colds, whooping cough, and respiratory ailments. It was also believed that garlic juice applied to the ear would cure deafness. During WWI British, French, and Russian army physicians used garlic to treat infected battle wounds and to treat and prevent dysentery. It wasn’t until the 1920’s when garlic’s mysteries became apparent. Researchers isolated allin in the garlic, that when it comes in contact with the garlic enzyme allinase, becomes allicin, a powerful antibiotic. This is done naturally when garlic is crushed or chewed. Since then studies have shown that garlic can kill the bacteria that cause tuberculosis, food poisoning, and bladder infections. It also may prevent infection from the influenza virus. It has been shown to be effective in treating the fungi that cause athlete’s foot and vaginal yeast infections as well. Some studies have shown garlic to help reduce blood sugar levels and could be used in conjunction with contemporary medicine to help fight diabetes. European studies have shown garlic to help eliminate lead and other toxic heavy metals from the body. There are even preliminary studies looking at garlic to help AIDA patients keep their immune functions up and running. To help eliminate garlic breath try chewing parsley, fennel or fenugreek after eating. Garlic should only be used in medicinal amounts in consultation with your doctor. If it causes minor discomfort, such as stomach upset, reduce intake or stop using it. The Latin name means “cultivated onion”. Three botanical varieties are known but many show combinations of characteristics of two or more varieties. The essential oil is generally regarded as safe at 0.01 to 40 ppm. Fresh garlic has the highest content of active ingredients with freeze dried garlic coming in second. Further processing lowers the active ingredients and deodorized products have virtually eliminated the active ingredients. Planting recommendations for the eastern US yield approximately 1,375 lbs of garlic per acre. To avoid disease, plant where onions have not been planted in the past five years. Grade standards include “USDA No.1” and “unclassified”. USDA No. 1 consists of mature garlic with compact, plump cloves, free from dirt, mold, sunburn, stains, cuts, sprouts, roots, insects, or mechanical damage. Any garlic that does not meet these standards is considered “unclassified”. California, especially the area around Gilroy, leads in the domestic production of fresh and dehydrated garlic. Dehydrated garlic is also imported from mainly Taiwan and mainland China. This week I was back to making soap and doing lots of stuff around the house. C took the long weekend off so we started some home improvement projects as well. My dad came in on Sunday so I also got to see him for a few days and although I didn’t get as much as I would have liked to get accomplished actually finished, it was a pretty good week. Monday: I started cleaning my tent and it was a mess. Once they get wet they need to be dried out as soon as possible or the black algae starts to grow and just turns the tent into a grey gross mess that makes it look so bad and dirty forever. We had to pack it after Folk Fest in the rain and the rain over the next week kept me from having the chance to dry it out any earlier. I called some customers about their orders, made a doctors appointment, got a prescription refilled, called the pest control place so they could come out and tell me how to get rid of my mouse in my house, did laundry, paid bills, made soap, and froze some goat’s milk that I had been given for future use. I picked up C from the airport late at night, but at least the flight was on time so it wasn’t all that bad. Tuesday: The pest control guy came and gave me an estimate, and don’t you know, I haven’t seen the mouse since he came! I cleaned up some soaps (the soap on a rope need the ropes cleaned from excess sop before packaging) and went to the grocery store, it was my first home cooked meal in weeks. Also did some chores like cleaning the cat pan, taking out the garbage and putting chlorine in the hot tub. I also finished freezing the last of the goat’s milk. Wednesday: I mailed orders, caught up on the blog, measured out lye and oils for soap and made one match of my dad’s special soap, that I poured too hot- so it volcanoes right out of the mold and onto the floor. Thursday: C was home and I got some things for the business done in the morning. I blogged, answered e-mails, ordered fragrance, got a application sent out and made two batches of dad’s soap (cleaned up my mess from the day before). C and I went to Ikea for some things, and then tried to find where I could test drive the SMART car I want when it comes out but I got lost and never found the location of the event. We also got paint chips to help us decide what color we want to paint the upstairs rooms. Friday: In the morning I made a batch of soap, got a money order for my dad so he could pay his speeding ticket, cleaned the cat pan, checked the hot tub, and got soap out of the molds it was in. C and I went and bought paint and then started to paint the ½ bath and the master bedroom. Saturday: More soap from molds, cut some soap into bars, started making samplers, cleaned molds, and pots. I went to the garden and harvested what will be almost the last of my cucumbers; I may get 6-7 more, but not many. I made a bunch of salads and started some others. And C and I painted more, starting the second coat. Sunday: I left early in the morning to pick up my dad, C finished cleaning the tent while I was gone. We went to dinner that night and had a great meal with an interesting selection of imported beer as well. Dad and I started going through our DVD collection- we keep a list and keep it in alphabetical order so once a year or so we try and go through and make sure everything is where it belongs and we haven’t missed anything.